Confluence Project momentum is building, and we’re now halfway there. But could we be dropping the ball? For more than two years we’ve followed the initial progress on the biggest development proposal in the history of Eau Claire – the wobbly three-legged stool known as the Confluence Project. We’ve all watched it teeter back and forth, right there on the banks of the Eau Claire and Chippewa rivers, as the community debated what should and will happen. 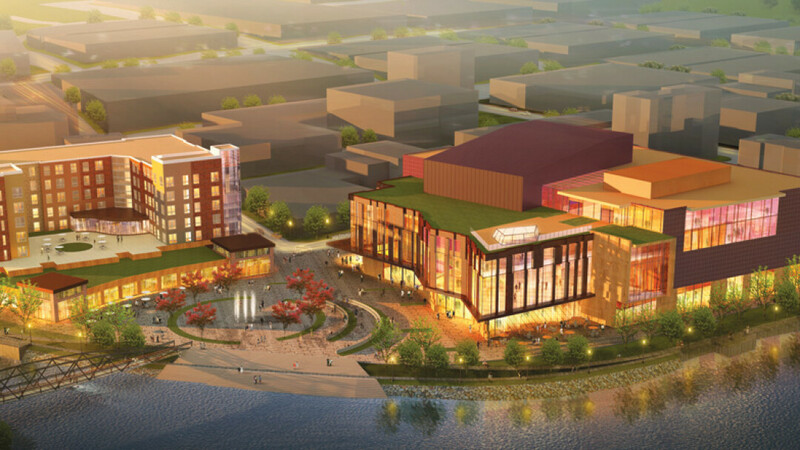 The three legs: a $25 million mixed-use building (on which construction has recently begun), a $5 million public plaza, and a roughly $50 million performing arts and education center – a partnership between UW-Eau Claire, The Eau Claire Regional Arts Center, and others. As of this writing, the local philanthropy-powered funding we need to build the performing arts center leg recently passed the $6 million mark after hovering at just over $5 million for most of the year. That’s great news. Momentum is building. But there’s a problem: that amount is still less than half what it needs to be. Locally, we need at least $13 million in private donations. Why are we still so short of the mark? Because you haven’t pledged yet. Get this – when you consider the nearly 12,000 people in Eau Claire County who voted in favor of the project last April, very few people have actually pledged. 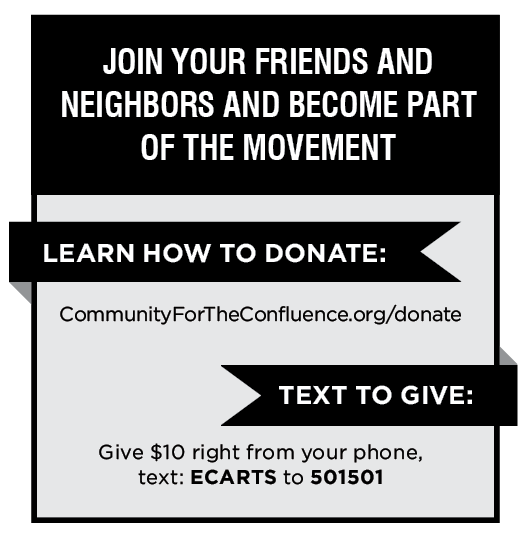 When you combine the campaign’s various funding channels, even including the very easy “text to give” option, fewer than 500 people or businesses have financially committed to the project so far. That means the equivalent of only 0.8 percent of the city’s population has stepped up with a donation (of any size) to become a real, functioning part of this thing. Compare this with the nearly 60 percent of city voters who supported it, and it’s obvious that we’ve got a philanthropic disconnect on our hands. Throughout the past couple of years, headlines have occasionally popped up when local businesses put down big dollars for the project – $100,000 here, $1 million there – and to be sure, that’s the fastest way to get where the Confluence Project needs to be. But what would be truly exciting, and what would make for a genuinely legendary movement worthy of our community’s recent energy, would be if thousands of us stood up with small chunks of our own money – $50, $500, $5,000, whatever you can afford – to create a truly crowd-funded crown jewel for our region. A place we all built together, with a brighter future in mind. Much has been said about the wide-ranging economic, social, and cultural benefits this project can deliver. And if you’re reading this, you probably understand that this project’s bold vision is what Eau Claire desperately needs. But as we’re now learning, what the project itself desperately needs is you. So it’s time to stop waiting. Put your money where your heart is. And don’t be fooled. We’ve all heard so much for so long about the Confluence Project that it seems like the buildings will just suddenly materialize any day now. We can’t forget that if too many of us wait too long to donate (or simply don’t donate), that the place may not appear at all. I don’t think any of us want our community’s history to reflect that kind of failed opportunity. And I know I don’t want to be among the guilty. So I ask you, when it’s all said and done, do you want to be one of the proud people standing on the new plaza at the confluence of our city’s two beautiful rivers, pointing up to our amazing new performance center, able to turn back to your kids and say, “Our family helped build that”? Do you want that? I do. There are countless ways to teach your kids how to be part of a community, but not many of them have that much power. That’s leading by example. That’s leaving a legacy.